Tell that you have seen something like this before. During last night's Raptors-Wizards game in D.C., Rudy Gay nailed a three and made the classic "call me" sign to somebody in the crowd, who turned out to be the rapper Wale, who you may know from being awful on the Celeb Team in NBA 2K13. Raptors announcer Matt Devlin all but called him out for heckling and knocked him in comparison to Drake. Then it got bizarre. Let's go to the videotape. Wale found out and was none too pleased, as shown by this tweet. And then he decided to get near the booth to confront Devlin. This actually happened. Well then, as we all knew, Rudy Gay said that he and Wale were just joking, showing a natural conclusion to a ridiculous sequence. 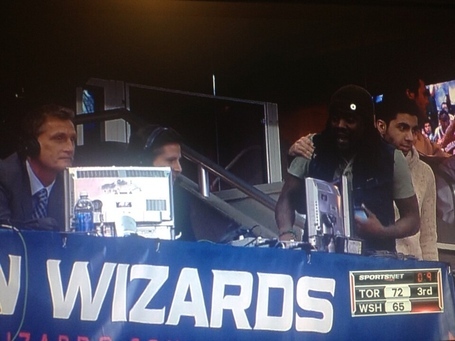 Me and @wale was just joking y'all. Thats my boy right there.